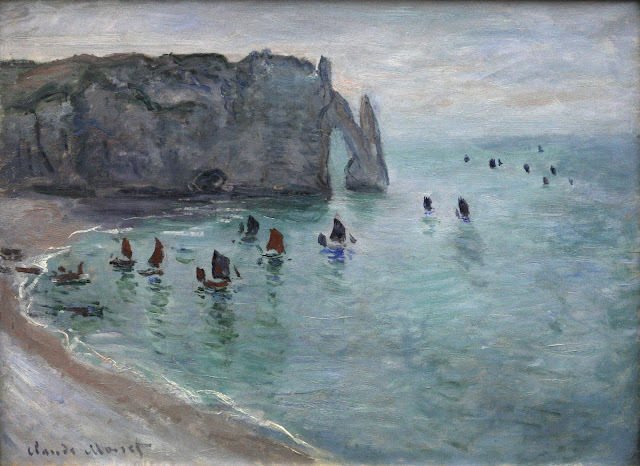 Étretat is a commune in the Seine-Maritime department in the Haute-Normandie region in northern France. 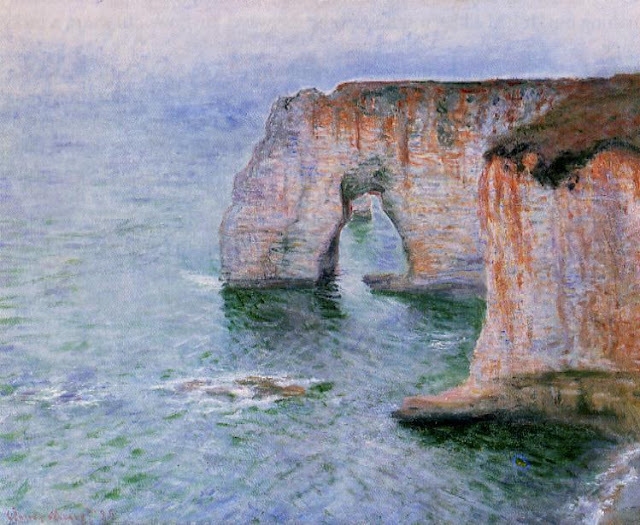 It’s best known for its cliffs which have famous natural arches formed into them. 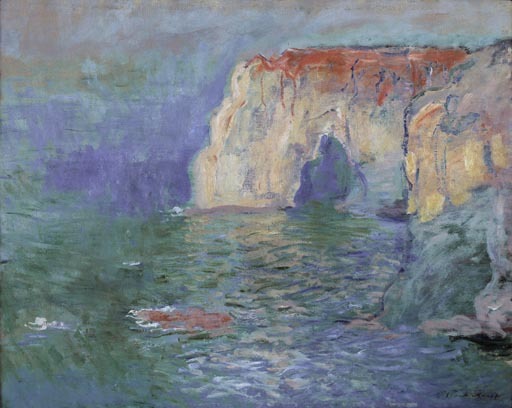 These cliffs and the associated resort beach attracted artists including Eugène Delacroix (1798 – 1863), Gustave Courbet (1819 – 1877), Eugène Boudin (1824 – 1898) and Claude Monet (1840 – 1926), and were featured prominently in the 1909 Arsène Lupin novel The Hollow Needle by Maurice Leblanc. 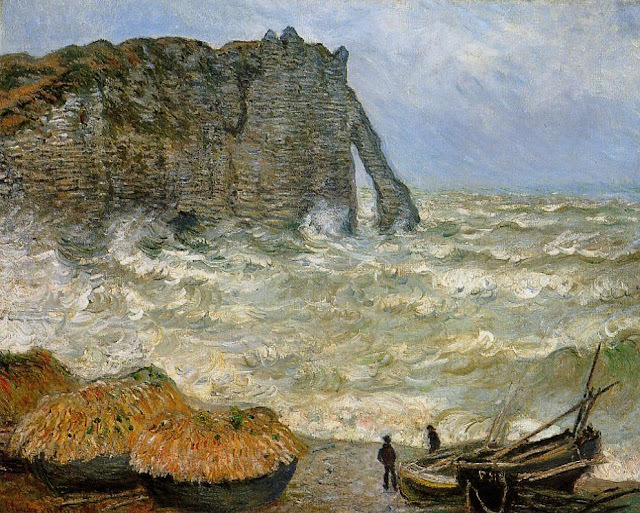 Part 1 of this post features the Étretat works of Delacroix, Corbet, and Boudin. 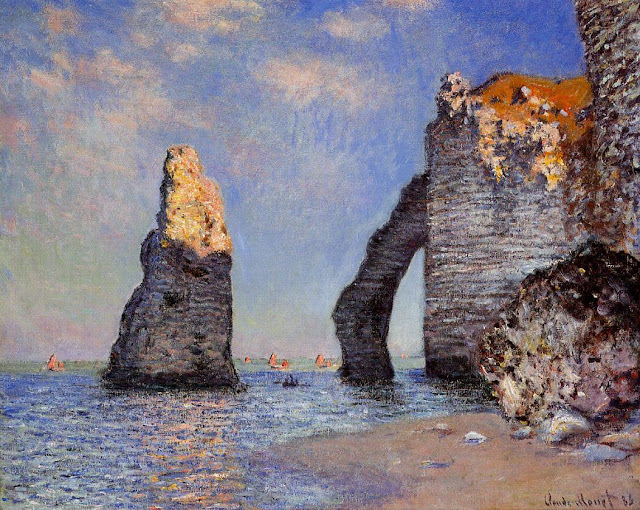 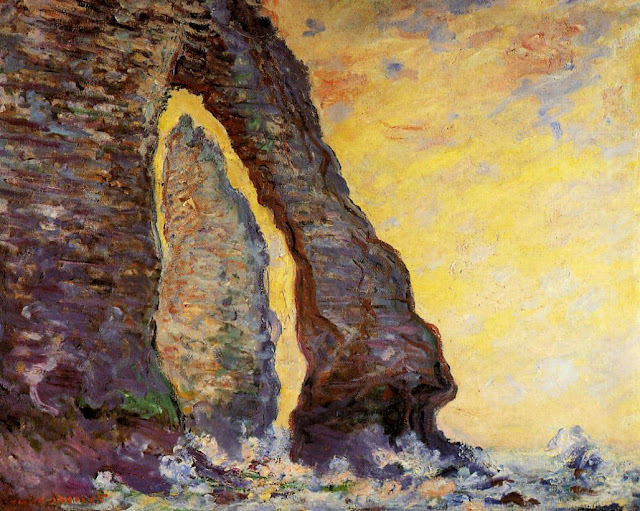 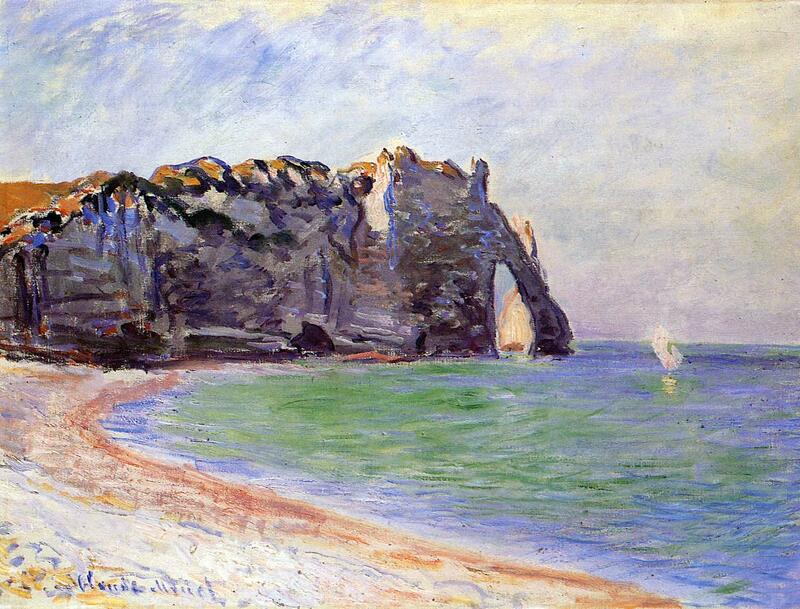 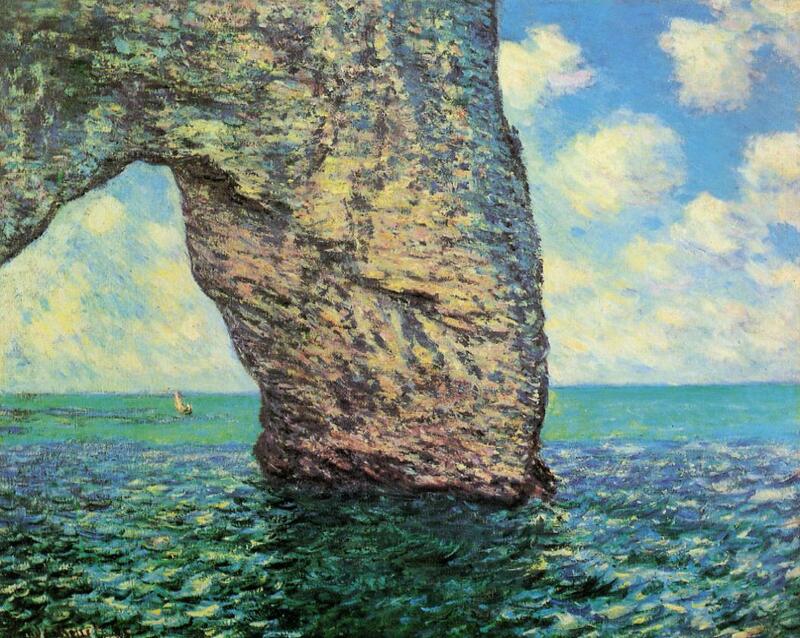 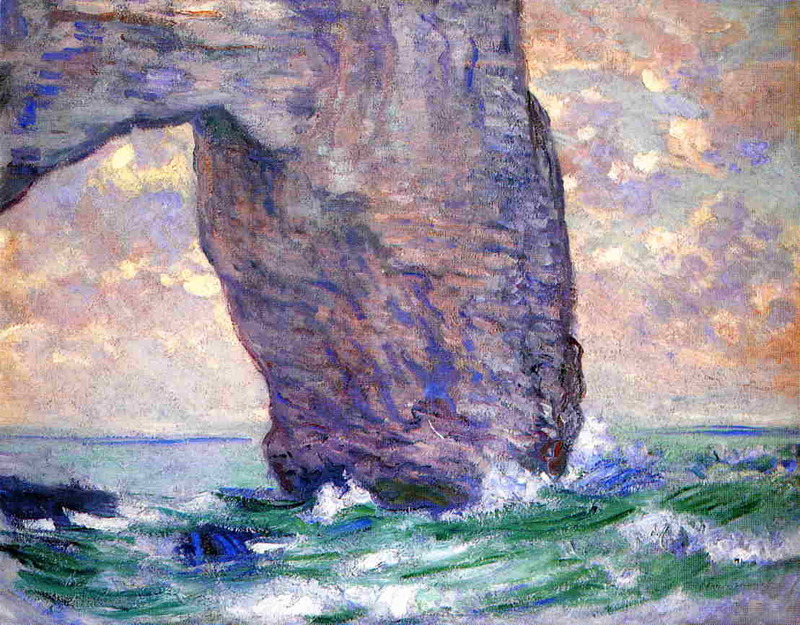 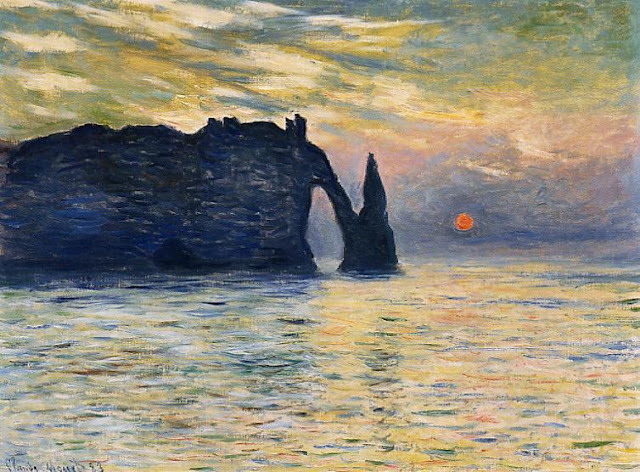 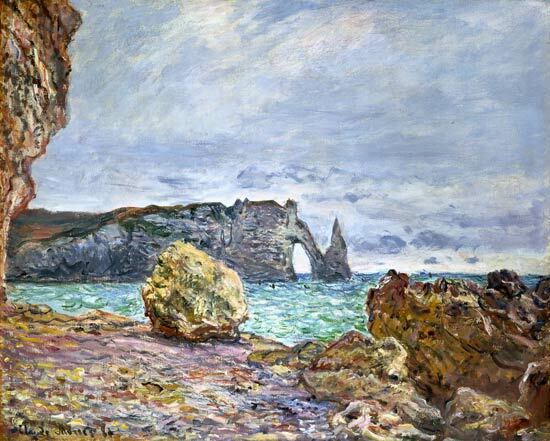 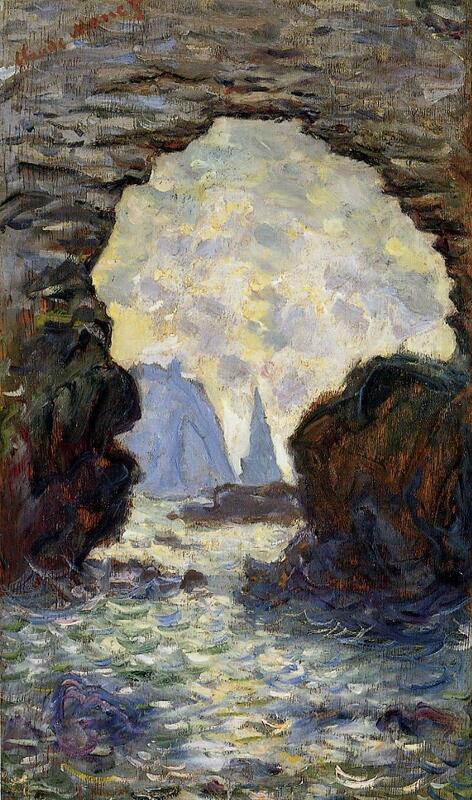 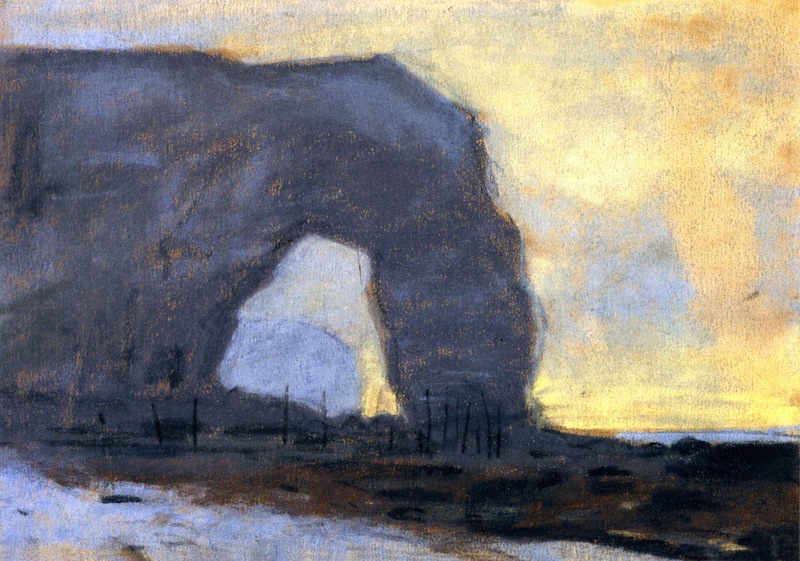 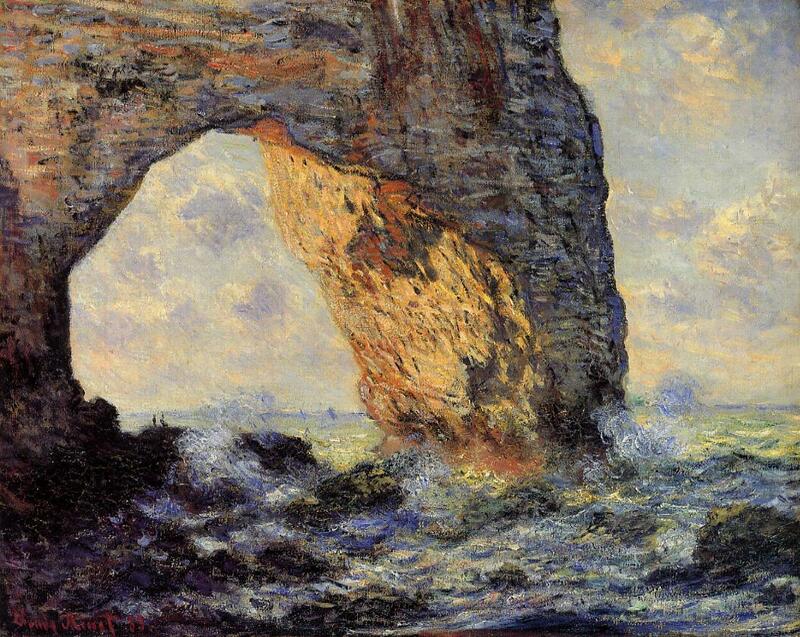 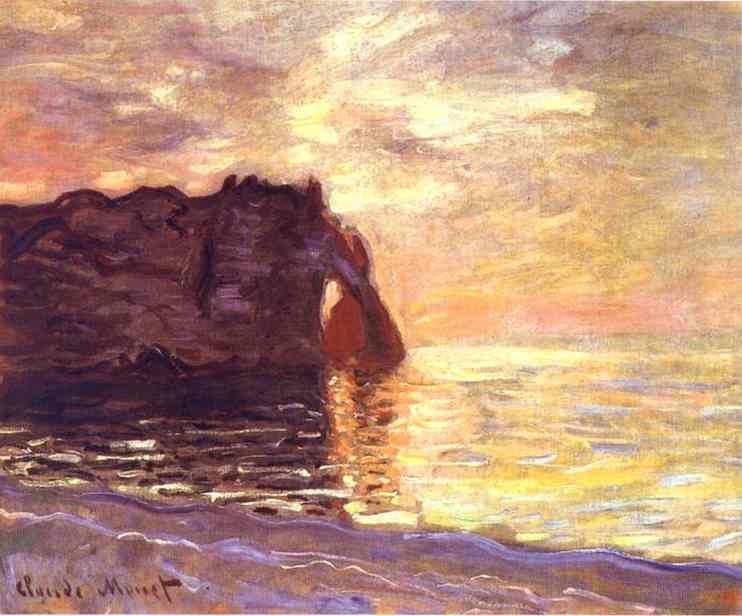 Part 2 features the Étretat works of Monet. 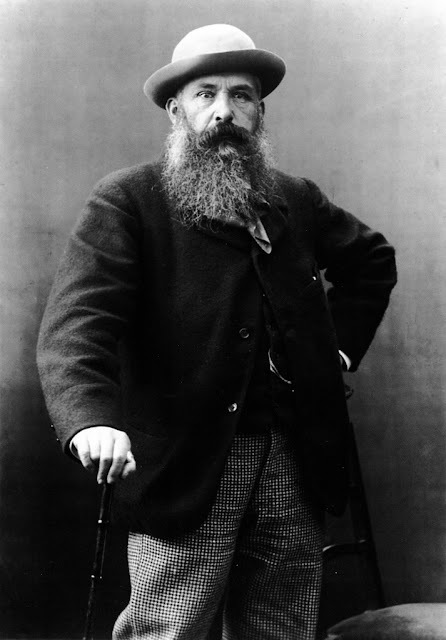 Claude Monet (1840 – 1926) was the original founder and practitioner of the French Impressionist movement in painting. Some of his best-known works include Impression, Sunrise (for which the movement was named), the Water Lilies series, and the Haystacks series. During the 1880s, Monet rediscovered the Normandy coast and made repeated visits there to draw by the sea. 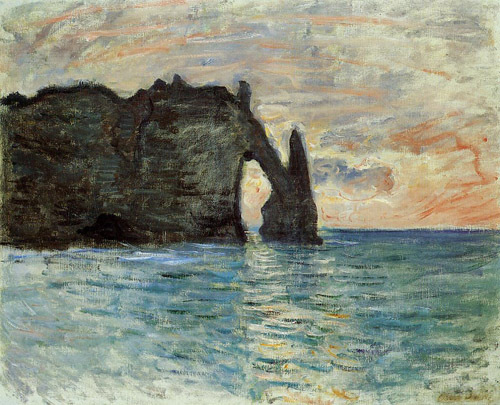 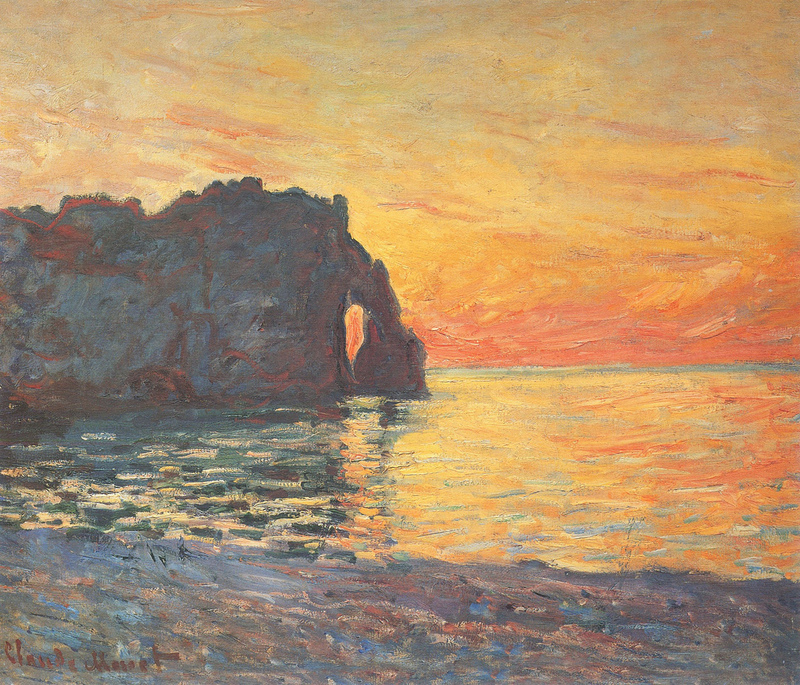 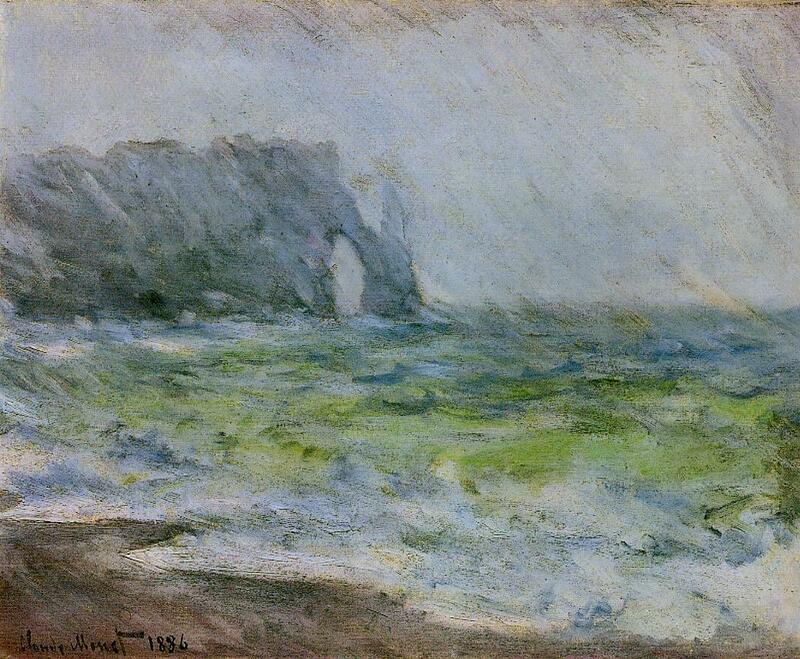 Étretat had already been painted by both Delacroix and Courbet; Monet in fact owned a Delacroix watercolour of the area. 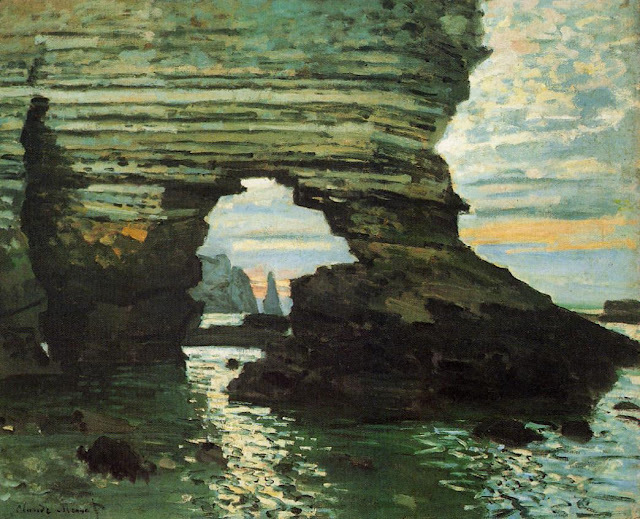 The Courbet retrospective at the Ecole des Beaux-Arts in 1882 featured a group of Étretat seascapes. 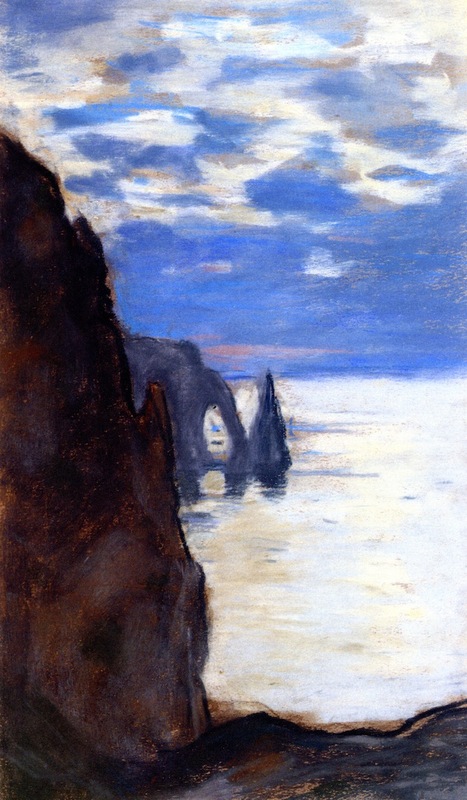 Monet visited Étretat in 1883 with plans to create his own Normandy seascapes: “I reckon on doing a big canvas on the cliff of Étretat, although it’s terribly audacious of me to do that after Courbet who did it so well, but I’ll try to do it differently.” The region had become a fashionable holiday destination for Parisians, which may have encouraged Monet to create paintings for a growing market. In the 1890s, Monet began producing his series paintings: multiple images of the same subject done at different times of day and captured in different kinds of light. 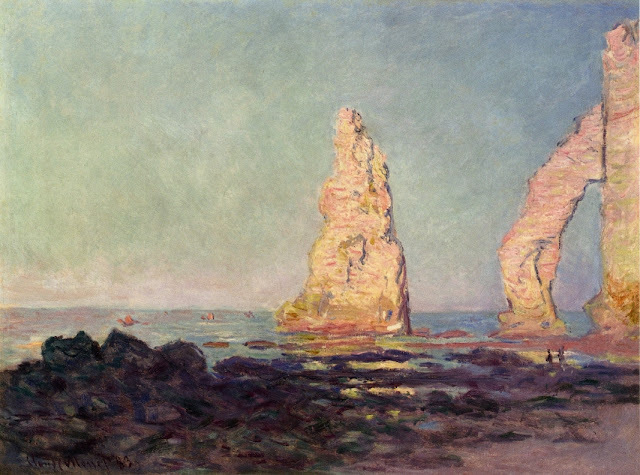 In the 1880s, Monet painted and drew the coast north of Le Havre at Étretat repeatedly, and the body of work he produced shows that he was already thinking in terms of repeated representations of the same subject. 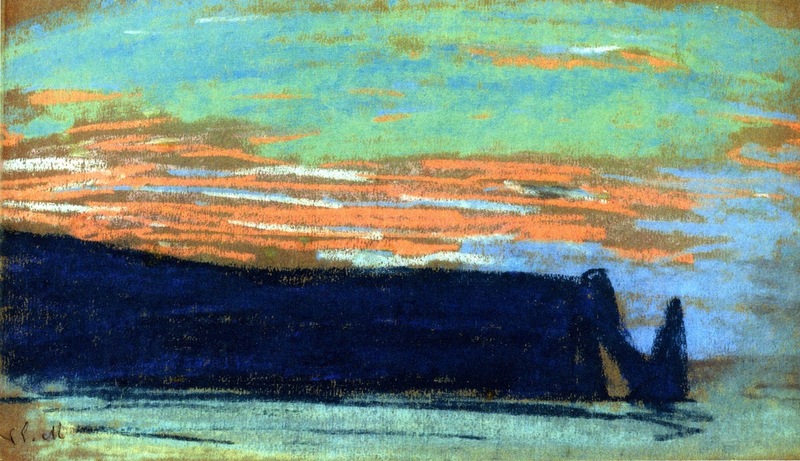 Some of the pieces shown here are in pastel, a medium that enabled Monet to note down ideas for composition and colour with speed.